Rental companies are reporting a rising demand for lightweight shooting kits even for commercials and movies, increasing use of hand-held, use of Steadicam, gimbals and other body rigs which keep the camera moving much of the time. While the camera monitor can generally be cabled, further monitoring is as important as ever for directors, DoPs, focus pullers, video village crew and others who need to see camera output. With these moving cameras umbilical cables become impractical, hence requirement for a small, lightweight HD high quality, reliable wireless monitor and support system. The Starlite range of monitor-recorders comprises the StarliteHD which is a lightweight touch screen OLED 5" touch screen monitor-recorder. Input is 3G / HD-SDI with a reclocked output. Built-in tools include a high resolution waveform monitor and precision vectorscope, and an inbuilt recorder delivers dailies in H.264 on to SD cards.The Starlite ARRI is the same product but with the addition of touch screen control of key functions of the ARRI ALEXA Mini and AMIRA cameras. The new StarliteRF is similar again to the StarliteHD, but with inbuilt wireless receiver. It comes bundled with their latest TitanHD2 Tx. 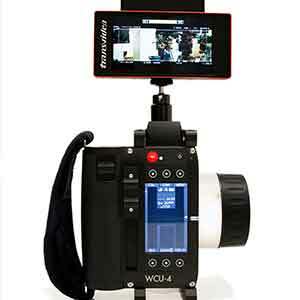 Additional stand-alone receivers Rx can be added for customised production crew requirements. To get a true idea of how the StarliteRF is being used and the feedback from those in the field we asked several users for their experiences and first up is Corey Webb, Tech Ops Manager of VE Crew who said "Some of our long term series clients are still using SD wireless products from Transvideo as no other company has produced a wireless monitor with in-built receiver switchable between multiple inputs. The Titan, ahead of its time, enabled a director to view up to four cameras simultaneously by switching through the RF signals. When we heard that this HD product was imminent from Transvideo, the StarliteRF, I was pleased to hear that switching would be included. We purchased two units with a view to purchase more as demand grew. We've had long experience of Transvideo kit ruggedness and reliability, essential for rental. " Marcus Brent-Smith, VE Crew Camera Assistant for The Apprentice added "The StarliteRF was easy to use and being HD, a great benefit over the composite Titans. The Production Directors using the monitors were impressed by the small size and weight, HD picture, bright display and ease of use. Once paired, you simply switch on the Rx and it links to the Tx in a few seconds. They found the monitors especially useful for checking that shots were covered during OBs doc style group conversations." Moving on to Pinewood Studios is David Palmer from Movitech Camera Rentals who comments "It's stable, easy to connect, to sync up between the Tx and Rx; very user friendly. We've bought some small brackets to mount it on our Preston or Arri remote focus systems. It's been out on high profile commercials - three or four focus pullers at the top of their field have used it and they've all praised it and found it very fit for purpose." "It has a dual use when used with a further TitanHD2 Rx, available separately. You have a single Tx on the camera; you have a Rx in the video village, and then the focus puller has the StarliteRF monitor with its built in receiver so he can check and adjust focus remotely with no cables to tie him down. Previous Transvideo wireless systems were good, but this is a step forward because the Tx is very small and the Rx is built in to the monitor." "We tested the system for interference here at Pinewood Studios - wifi signals everywhere- everyone's got a phone and tablet: all the studio and sound stage activities going on, the air waves are extremely crowded, but we've had no interference problems." Finally DoP Adi Geisegger who specialises in aerial and mountain cinematography and photography working mainly in Austria and Germany had this to say "With a friend I designed a wing mount for my Freefly MVI M10, the end result eliminating vibration. Transvideo's TitanHD2 Tx at the camera transmits to the StarliteRF mounted in the cockpit. The wireless link provides a quick, easy and reliable way to monitor what I'm shooting.The wireless range is impressive; On our 1.2km long airfield, I sat on the ground with the monitor at one end with the camera on the plane, and it transmitted perfectly along the whole length of the airfield. The Sony battery on the monitor rear gives around 40 minutes of operation, very good." "I use the MVI a lot, and in helicopters too, and the StarliteRF is especially good conveniently mounted on the cross bar of the gimbal. When the ARRI ALEXA Mini was close to launch I was asked by ARRI to make a short film you'll find on Vimeo, 'The Focus'. I used the StarliteARRI 5" recorder-monitor on this and I was able to adjust camera parameters like ISO, shutter speed, start/stop and aperture directly from the touch screen of the monitor-easier and quicker than having to locate and adjust the camera controls."